CECHExx - Model E - console in North America, South Korea, Singapore/Malasia, Mexico and Hong Kong. This 80gb PS3 was the last console to have any PS2 backwards compatibility and a card reader. It was also the first PS3 to be bundled with a game. 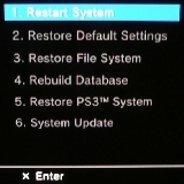 Just like the PAL territories' original "60gb" system, this new version of the PS3 hardware did not have full PS2 compatibility. Like the PAL CECHC, it had partial compatibility via a combination of the PS2's "Graphics Synthesizer" GPU and software-driven emulation. The lack of the PS2's original "Emotion Engine" CPU limited PS2 compatibility to less than 90% of the system's library. This model commonly shipped bundled with Motorstorm or Metal Gear Solid 4. USB - The front of the CECHE console has four USB 2.0 compatible ports.